A black and white negative of Gaye (Goldie) Levine standing outside on August 13, 1938. In this view she is smiling. Gaye (Goldie) Levine is one of six children. 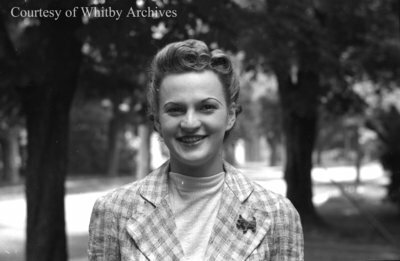 Her parents were Louis and Rebecca Levine and they lived on Brock Street in Whitby, Ontario. Gayle Levine, August 13, 1938, Marjorie Ruddy. Whitby Archives A2013_040_743C.